Hugh Jackman’s Wolverine Workout: Hugh Jackman as Wolverine is lean, but strong enough to tackle anything that comes his way! 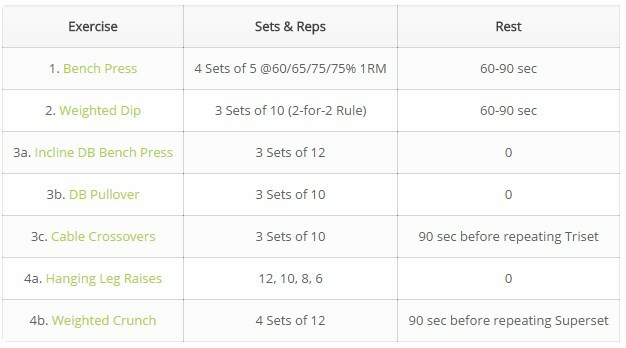 He trained hard to get the physique, and now you can follow in his footsteps with this training schedule from muscleandstrength.com. Hugh Jackman’s physical transformation over the past years has made him one of the most impressive Hollywood physiques to cross the red carpet in the last decades. The role of Wolverine in the X-Men series is perhaps the most responsible for his physical transformation. Hugh first took on the role of Wolverine in 1999 and has transformed his body dramatically for the role on and off since then. His most dramatic transformation took place in X-Men Origins: Wolverine. 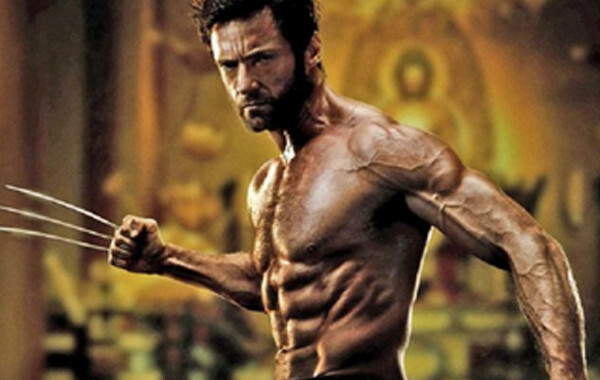 To transform his physique for the 2009 film, Jackman worked for over 6 months to pack on muscle and transform himself into the impressive image of Wolverine we all know. I say all of this to make sure that I give credit where credit is due. The road to Hugh’s transformation was a long journey that required consistency and hard work. During the height of his training, Hugh was training over two hours a day seven days a week with cardio and weight training. To find out the specifics of his workout, you can view his trainer David Kingsbury’s blog. When observing someone else’s workout, remember that it is made specifically for them. In other words, for accomplishing their goals, addressing their weaknesses, taking into consideration their timeline, and utilizing the time they have available during the week to train. In Hugh Jackman’s case, he exercised for more than 14 hours each week. That’s a part time job. Most people do not have 14 hours to train or a deadline they must meet or risk losing millions of dollars. You can still learn from Hugh Jackman’s training and use it to reach your goals and have a physique that turns heads. You must look beyond the exercises, sets and reps schemes and view the underlying principles that his workout is based upon and apply them to your own training. After deconstructing Jackman’s workout, here are the underlying principles and factors that allowed him to attain and maintain a superhero’s physique. All fitness programs should apply this principle, and if they don’t you should question whether or not you are spending your time wisely in the gym. To apply the principle of progressive overload you need to ensure that you are improving every time that you walk into the gym. Whether it is by decreasing the amount of rest in between sets, increasing the amount of weight you lift, or the number of reps in your sets, you must strive to progress in order to bring about change in your body. The easiest way to ensure progress is to keep a workout log so you can look at the details of your last workout and make your adjustments from there. Your adjustments each workout don’t have to be the same. One workout you might increase the number of reps and the next workout you might decrease the reps and increase the load then work your way back up to performing more reps with heavier weights. Or maybe you just decide to cut your rest periods and try and keep the weight and reps the same. The point here is to make sure that you are always moving towards your goal! Use the 2 for 2 rule: if you perform an exercise for 2 reps over your goal reps for 2 consecutive workouts then you increase the weight you are lifting by 5-10 lbs and work towards repeating the process of the 2 for 2 rule again. Hugh’s trainer picks four big lifts in which he prioritizes strength development. He bases the sets and reps off of a percentage of Hugh’s One-Rep Max in each of four chosen lifts: bench press, deadlift, squat, and weighted chins. Jackman’s trainer waves the sets and reps in four week cycles which systematically increase in intensity for three weeks. On the fourth week he decreases intensity and adds volume before starting the cycle over again with a heavier (+ 5-10lbs) predicted 1RM. 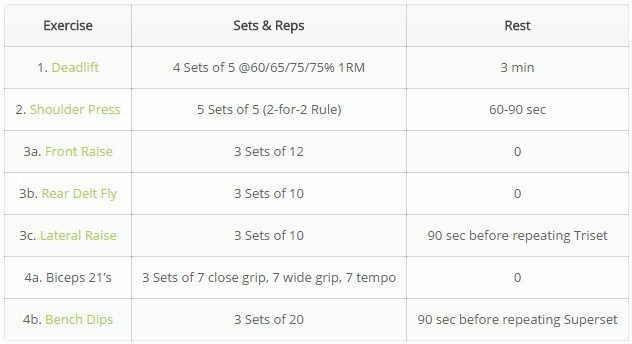 To apply this to your own training, you can take the percentages, sets, and reps from Hugh’s workout or you can invest in another percentage based training system like Jim Wendler’s 5/3/1 or Chad Wesley’s Juggernaut program and utilize the sets, reps, and percentages to ensure that you keep making consistent gains in strength. When you get stronger, you are able to translate that new strength into more weight and reps in your hypertrophy work which will allow you to build more muscle. The key is to have a plan to keep getting stronger and stick to the plan! Percentage based strength work is performed at the beginning of the workout and only for the main lift of the day. The rest of the exercises in the workout should stick to the 2 for 2 rule. This is another principle that you can steal from Hugh’s training. You’ll make more gains if you have someone or something holding you accountable. You may stay accountable to a coach or workout partner, or even an event deadline. Hugh has a number of factors keeping him accountable: his trainer, his group of workout partners that he calls the Dogpound (you can check them out on Instagram at the hashtag #Dogpound), and his job that requires him to maintain a certain appearance. Take advantage of accountability to reach your goals too. It doesn’t matter if it’s entering a 10K, powerlifting or weightlifting meet, or a CrossFit or bodybuilding competition. The fact that you have a deadline keeps you accountable to your training. If using an event to stay accountable is not in your wheel house, get a training partner or a coach to help out and provide positive feedback and encouragement (or a foot in the rear) when training gets tough. Transforming your physique is a process and it was no different for Hugh than for anyone else. It takes time and consistency for your body to achieve the desired adaptations to training that you want it to have. This is perhaps the most important factor in Hugh’s training that delivers results. Your body will not make long-term changes with short-term training programs. Hugh’s program didn’t change much from week to week. He used the same exercises week in and week out for upwards of SIX months. The variety came from increasing and decreasing the amount of sets and reps or the weight being used (see progressive overload). You need to keep grinding away week after week in order to achieve your goals of looking or performing a certain way. To apply this to your own training, find a long term program that is organized and allows for you to keep progressing towards your goals and see it through till the end. Stick to a program instead of hopping from one program to the next and give your body time to make the adaptations that you want. 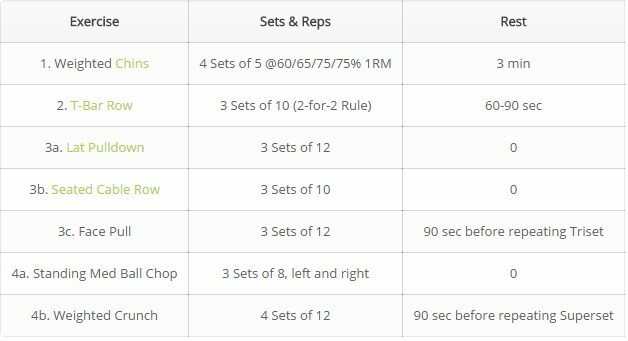 Here’s a sample of what a 4 day a week workout would look like using principles from Hugh’s workouts for week one in a four-week cycle.